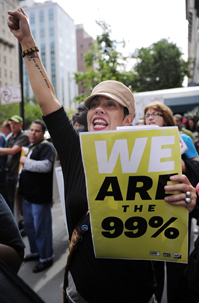 Does the protest against inequality have staying power? Demonstrators protesting income inequality and corporate greed have taken over parks and other public places across the country in the wake of the Occupy Wall Street protest launched in September near New York City's Financial District. Police have shut down many camps following mass arrests, occasional violence and heavy-handed police tactics, including in New York and Oakland, Calif. Still, while top Republicans have condemned the protesters as divisive and dangerous, some Democratic politicians have voiced sympathy for their message. The movement's main claim — that the U.S. political and economic system benefits the richest 1 percent to the detriment of the other 99 percent — has put the issue of economic fairness front and center in the presidential race. But the Occupy movement faces a long, cold winter and a pair of daunting challenges: defining its long-term goals and forming a leadership structure that can chart a sustainable course for the protest effort.